I had been heavy my entire life. Because of my size, I was picked on in school and later at work--people can be very cruel and judgemental. Before I had surgery I was tired all of the time. I was so tired of being tired. I just had no energy. After work, I did not do much of anything. I spent a lot of time on the couch watching T.V. The house was a mess with the dishes and laundry both piled up. I had knee pain, but no other obesity related diseases yet. My husband and I were trying to have a baby, but were not having success. We started the adoption process and in November of 2007 we had a beautiful 11 month old baby come into our lives. It is amazing how much of an impact a little person can have on your world. I suddenly wanted to make sure that I was going to be able to run and play with her--to be there years in the future to see her wedding day and the children that she would bring into the world. 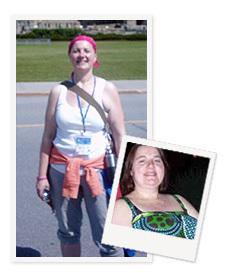 I had tried everything to lose weight--Weight Watchers, Atkins, using the Canadian Food Guide, and working with dietitians. Some of it worked. I did lose 50 pounds, 30 pounds, or 17 pounds at a time--but would shortly regain all of the lost weight and then some. I went online and started researching my options. That is where I found Barix Clinics. I sent away for information and received a brochure in the mail. I scheduled a consultation right away. The trip down to the hospital was ten hours, but well worth it. I left with a good understanding of the surgery, lots of information and a pre-surgery healthful habits handout. I completed all of the required testing and got started on the pre-surgery diet right away. I actually lost 43 pounds between my consultation and surgery. I knew that I was off to a good start. I cannot say enough about the care I received while at Barix in Ypsilanti. Everyone was kind and helpful from my first step into the building until I went home and after. I was so impressed when my nurse called me at home after my surgery to see how I was doing. I had surgery on a Monday and went home on Wednesday. I was back to work three weeks later. I have been horseback riding. I went to an 8-week boot camp. The most rewarding physical activity that weight loss made possible was The Weekend to End Breast Cancer, a 60k walk which raised 2.1 million dollars. I can now do things that make me the person I have always wanted to be. Someone who does not quit, but sets goals and keeps them. I have been busy shopping for new clothes, trying to decide what I want to do next and playing with my daughter--I feel like a kid in a candy store. I was just accepted into paramedic school---my life has come full circle and now I can do my part to help others.